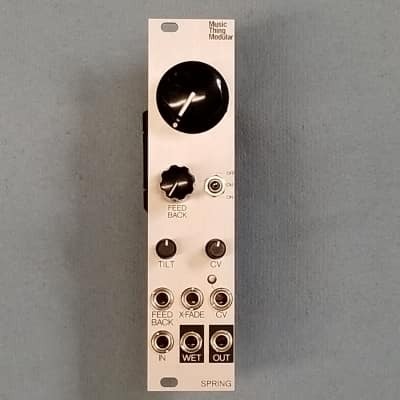 The Music Thing Spring Reverb is a flexible, easy-to-build voltage controlled DIY mono spring reverb module. Traditional guitar reverbs are tuned to the sound of the guitar and the amplifier it is played through. This circuit is different; designed to be relatively clean and high-fi, with a lot of bass response. It can also be abused and driven into (externally patched) feedback. The (optional, digital) Brick draws a considerable amount of current from +12V. measured at 75mA for the whole module. With just the spring, currenr draw is 25mA on both rails.